The event started in 1999 as a National Voice Day in Brazil as a reaction to a disturbingly large occurrence of laryngeal cancer in Brazil. The initiative quickly spread internationally. 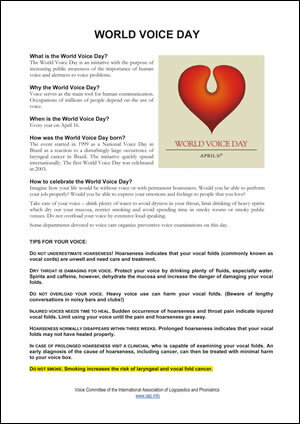 The first World Voice Day was celebrated in 2003.